What's the best pre workout supplement? A handy resource of information and reviews to help you choose the best pre workout for you. 4 Want reviews of other pre workout products? 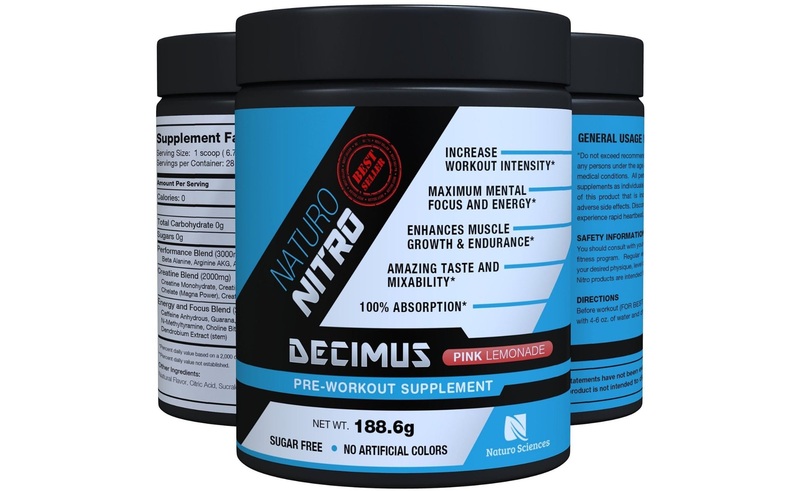 Much like Cellucor C4 Extreme, the Naturo Nitro pre workout Decimus supplement by Naturo Sciences is one of the most popular pre workout products on the market today. It is one of the new generation formulas that are really taking the science of supplementation to the next level. 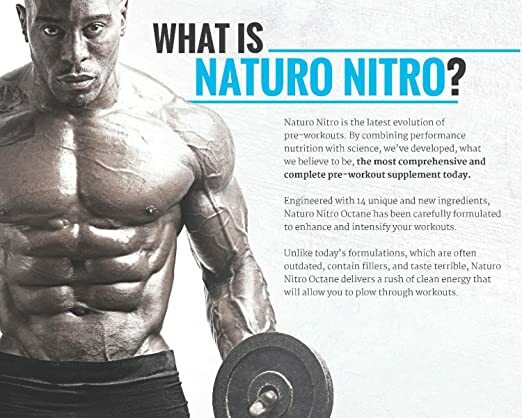 The science of building muscles is getting more advanced all the time and companies like Naturo Sciences are leveraging this every day to continually come up with better products to help people get more out of their body, particularly during resistance training. There are two things that really make this supplement stand out from the crowd in my eyes. Firstly (and I know this is a bit ridiculous) I absolutely love the packaging. I’m a sucker for anything blue, black and white and I really like seeing this container when I open the cupboard. That in itself motivates me and gets me excited to take some and head to the gym. This is actually more meaningful than it first seems as the majority of motivation comes from the mind and little boosts like the one I get when I see this packaging have been shown to increase motivation in psychological test subjects. The other thing which is a bit more meaningful to most people is the 3 proprietary blends. 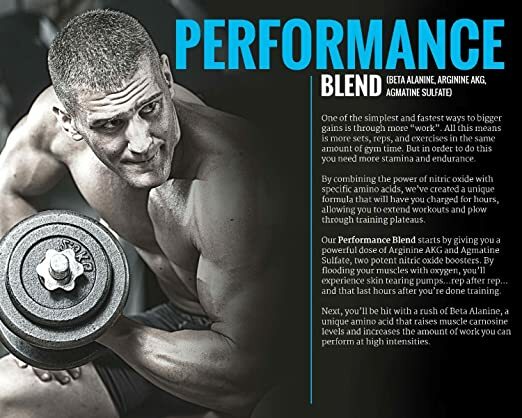 Now proprietary blends are nothing new to pre workout supplement formulas and pretty much all of them will have a proprietary blend at least for the energy/stimulant component. All sorts of science has gone into the creation of this bad boy though and they are not giving any of it away on the label, that’s for sure! Even though the amounts are not listed we can infer some things and we’ll examine these in more detail as we review this pre workout below. 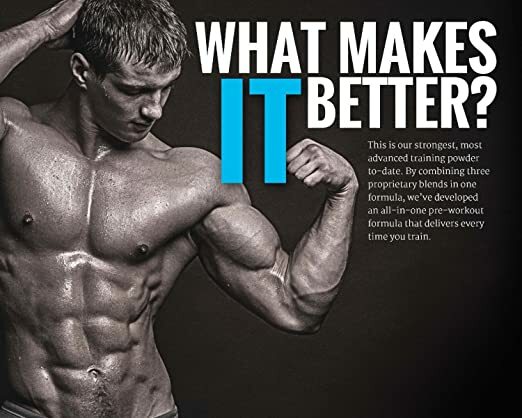 In theory this supplement has all the right ingredients to make a great product. According to the marketing and advertising of it these ingredients are combined in just the right proportions to maximize their usefulness to the body and hence their effectiveness while working out. This much I’ll give to them – the marketing and advertising is done brilliantly. I mean just check out the bodies of the guys in the images they have put out. They’re out of control! I think this is a fantastic supplement in its own right but I don’t believe the product quite lives up to the hype unfortunately and in the rest of this review I’ll explain why. Let’s examine the 3 different blends in a bit more detail. This looks good with 3 solid ingredients listed which are all proven to boost performance. FDA regulations ensure that ingredients are listed on labels in decreasing order so we can infer that Beta Alanine is the main component of the performance blend, followed by Arginine AKG and Agmatine Sulfate. Beta Alanine is a fundamental ingredient of almost all pre workout supplements and if it’s not on the ingredient list of any products it should be. Countless studies have proven the effectiveness of this substance in increasing the amount of work muscles can do before becoming fatigued. It does this by raising the levels of Carnosine in the muscles. This helps because Carnosine is depleted each time a muscle contracts and once it’s gone then we experience fatigue. So it follows that more Carnosine equals more contractions which equals a longer workout and more torn muscle fibers. Now this is all very well and good but the recommended dose for maximum benefits is between 4 and 5 grams per day. In order to get this you would have to either take 2 scoops of Naturo Nitro or stack it with an alternate source of Beta Alanine. This is on the extreme end though and you will still experience a benefit by adding any amount of Beta Alanine to your regime. Next is Arginine AKG, or AAKG or Arginine alphaketoglutarate. This enhances resistance training by boosting Nitric Oxide levels which in turn results in vasodilation. Vasodilation refers to the enlarging of the diameter of blood vessels, often referred to as widening. This helps boost performance of muscles by increasing blood flow which means more fuel can be transported to muscles and more waste can be removed from them, more quickly. A ‘pump enhancer’ or ‘vasodilator’ is an important component of any pre workout aimed to help improve resistance training workouts and AAKG has been shown to be very effective at this hence its inclusion in the formula of Decimus pre workout. The recommended dose for maximum benefit is at least 1500 mg but some sources even recommend up to 4000 mg. So similarly to the previous ingredient, you would need to take 2 scoops to hit this level but you will still experience a benefit from any additional AAKG. Agmatine Sulfate is another ingredient included mainly for its ‘pump enhancing’ properties. This compound is well known to boost N.O. (nitric oxide) production on its own but it also works synergistically with AAKG to maximise vasodilatation. For this reason I would say that the majority of the 3000mg is Beta Alanine and the rest is made up of AAKG and Agmatine. I would guess that the ratio is somewhere around 4:1:1 which is 2g Beta Alanine and 500mg each of AAKG and Agmatine Sulfate. Further to this it has also been shown to contribute to a boost in testosterone production. This is probably the best thing going for this product, in my opinion. Much like Beta Alanine, Creatine has long proven to be one of the most helpful and effective supplements for anyone looking to build strength and or muscle by doing resistance training. 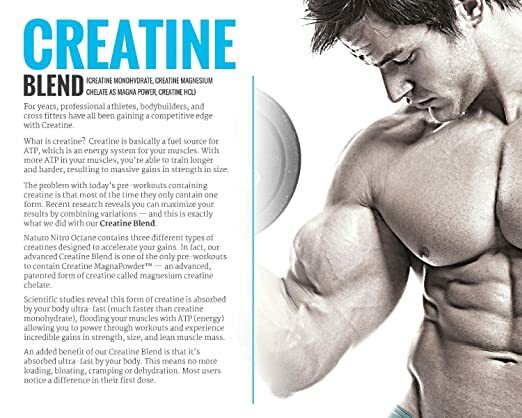 For the low down on how Creatine supplementation helps your training, check this out: Why-Take-a-Creatine-Supplement? Creatine is not new to pre workout drinks, but blending these 3 different types is definitely a new thing. So new in fact that the only real literature available on this blend is the stuff published by the Naturo Sciences themselves. With this being the case, we’re just going to have to take their word for it that this blend is the most effective way to get Creatine into your muscles yet. This needs to be the case too, as the recommended dose of Creatine for maximum benefits is greater than the 2g included in this mix. This is very likely the case as magnesium chelate is essential for Creatine utilization. The general recommendation for Creatine is 3-5 grams a day however many foods contain Creatine as well so how much you need to take depends how much you get in your diet. 3-5 grams is a good guideline though. Additionally, when you first start taking Creatine it is advisable to ‘load up’ your muscles with up to 20g a day for a week or so. After this week the 3-5 grams should be sufficient to maintain a healthy level of Creatine in your muscles. The ‘energy’ or ‘focus’ (stimulant) properties of a pre workout supplement are usually what determine the public’s perception of the product. This is because the thing that most users will notice and remember about a pre workout is how it makes them feel. This is also what most people will use to compare and contrast it to other products they may have tried. I say most because for bodybuilders and people that really take their training seriously the stimulant properties are of secondary concern compared to the pump and performance boosting properties of the ingredients like Beta Alanine and Creatine. These people are already motivated to get to the gym so what they want is something to help them push their bodies harder and maximize their gains. But for most people (myself included) a little energy and focus boost are important factors when it comes to choosing a pre workout. So let’s see what the Decimus pre workout has to offer in this department. Caffeine provides many benefits when taken before exercise, such as increasing energy and endurance levels, increasing motivation and also helping your body to burn fat. In addition to this it is high in antioxidants which bring on a host of other health benefits. The Guarana works with the caffeine in much the same way to boost energy, endurance and motivation. Yerba Mate has been appearing in a lot of pre workouts. It also contains caffeine however as well as this it is a good source of theobromine, which is the feel good component in chocolate. As well as this mood enhancing quality it also contains choline to help with focus and concentration. The real power ingredient here though is the N-Methyltyramine. This is a powerful stimulant that increases neurotransmitters like noradrenalin and dopamine which very effectively enhances both mood and performance. It is often touted as the replacement for DMAA. Picamilon is another nootropic that works to increase focus and mood. The Yohimbe HCL and Dendrobium Extract also have nootropic effects however because they are the last two ingredients listed we know that they are only present in small amounts so they are there more to complement the other ingredients than anything else. This is a quality supplement with a high calibre of ingredients that will definitely help to get the most out of any workout. The most notable thing about this formula is the ‘Energy and Focus Blend’. It has a solid foundation of central nervous system stimulants to get you itching to lift and this is complemented by a comprehensive nootropic component to ensure you stay focussed and happy throughout your workout. 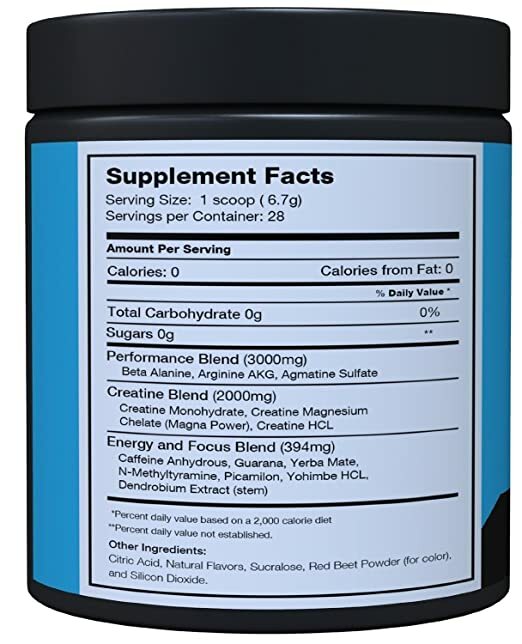 The Creatine Blend is potentially the start of a revolution in the way we get Creatine and certainly seems to be more effective than conventional Creatine supplements. The only thing that lets this product down is the ‘Performance Blend’. While it has the key ingredients in what we can only assume to be an optimum ratio it does not seem to contain enough of them to have maximum effectiveness. The only solution here is to take 2 serves at a time but I cannot advise this as I don’t want to get sued! All in all the Naturo Nitro pre workout Decimus is a great supplement and it will surely help you achieve better results in the gym. Many people have reported huge gains from using Naturo Nitro Decimus pre workout before their gym sessions. Become one of these people yourself! Want reviews of other pre workou t products? Check out some other reviews on the pre workout supplement reviews page. I must say I’ve learned a lot out of this post. It seems to me you have a passion for the gym which I can see in your knowledge about pre work out products. I’ve only ever tried 1 pre work out product (Forgot the name), but the effect on me is like you said, to get more focus when doing a work out, which enhances your performance. I guess that’s marketing tactics and if it works and there’s no complaints I guess that’s alright. What I was wondering about is if you know of any side effects/negative effects of using creatine and other performance enhancing things? I’m talking especially about long term side effects? I like the info you gave on the product, it was definitely helpful. Understanding the importance of the blend and the effects it has. Do you often get people asking you about the health aspects of the product; or does that effect peoples ability to purchase the first time around? I like the gym fails too, that was a good touch. I’m glad you found the review to be helpful. Pre workout supplements can really benefit your health as part of a balanced diet and exercise program by helping you to get the most out of the exercise that you do. They will still provide some health benefits due to the antioxidants and amino acids but the way they really add value is by maximizing the results you get from exercise. Hope that helps! 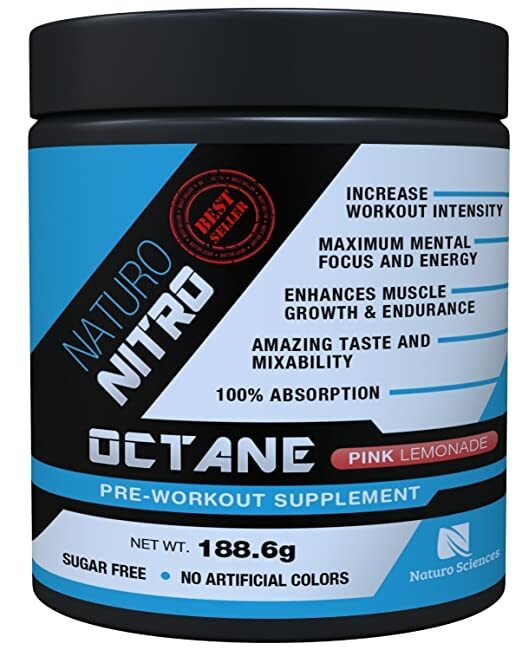 My question is what is the real difference between naturo nitro octane? And naturo nitro Decimus? From what I see it is one ingredient. Is this because of the FDA or is the decimus formula better?